While lunar eclipses aren’t as jaw-droopingly exciting as total solar eclipses, they are still an amazing thing to witness, as well as to capture as photographs. And a lunar eclipse comes with a big benefit: totality lasts much longer than during a solar eclipse, so you have more time to get creative as well as not stress out! I had last shot a lunar eclipse in 2014, which was a very special time. That blood moon was the second of a tetrad, a series of four consecutive total eclipses that occurred in approximately six-month intervals. The next time that will happen will be in 2032-33. I wonder how we will capture it then! Technology made a major leap from 2014 to 2019, so who knows how it will leap in another 13 years. Maybe we will be able to witness those lunar eclipses from the moon! The next lunar eclipse will occur in two years, on May 26, 2021. In the meantime, we wanted to share a few tips that we learned this year to help you better prepare not only for the next eclipse but for shooting the moon in general. And by “we,” I mean a few more people than usual. First I’ll talk about my experience shooting the eclipse this week, and then Matt will add some thoughts from his experience. 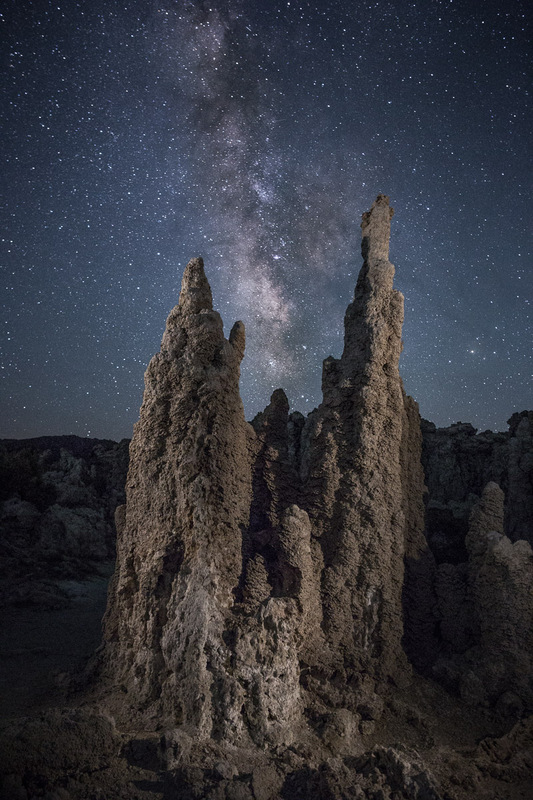 Finally, we have invited six of our National Parks at Night workshop alums to share their images and lessons learned. Understand the location you will be in to capture the moon. Will you be in an urban or rural environment? How can this location help tell your story? I saw lots of wonderful lunar eclipse phases placed over breathtaking landscapes, buildings, etc. You could do the same in an urban location. For this year’s lunar eclipse, I was in Atlanta, a city I wasn’t that familiar with and had little time to scout. I was inspired by the skyline I saw while driving into the city, and I noted that there were plenty of overpasses that could provide a good vantage point. 2. Ascertain the elevation of the eclipse. The 2019 super blood wolf moon (aka the lunar eclipse) over Atlanta. Foreground: 35mm lens, 25 seconds, f/16, ISO 200; background (moon): 600mm lens, 1/2 second, f/5.6, ISO 3200. You want to foresee what foreground you can include in a single shot. I was really taken aback by how high in the sky this lunar eclipse was. It was very difficult to introduce foreground into the scene unless you were really far away or made a composite. In hindsight, I could have gotten under the Skyview Atlanta Ferris Wheel downtown and probably made a pretty cool shot—but my last photo of a lunar eclipse (in 2014) included a Ferris wheel and I didn’t want to be known as that guy! This did make me realize that figuring out the problem—i.e., the height of the moon in the sky—can lead to unusual solutions like actually getting under your foreground to get the shot! 3. Go with two rigs. The lunar eclipse lasts approximately 4 to 5 hours. Give yourself more options to create! It could be wide and telephoto rigs, or short-exposure and long-exposure setups. 4. Be ready for that close-up! That big ol’ blood moon, 2019. This is advice for shooting the moon any time of the year: Use a telephoto lens. The more you can fill your frame, the better. Higher-resolution cameras will also allow us to crop into the image more with minimal loss in detail. This year I used a 100-400mm lens, which when zoomed in all the way was the equivalent of a 600mm with my APS-C sensor. I still cropped into the moon in post and would have preferred an effective focal length of 800mm to 1000mm in the field. While those lenses might seem expensive and out of reach, consider using crop-sensor cameras with 200-500mm or 150-600mm lenses. Also, you could adapt a telescope to fit your camera and can easily get to 1000mm. When using a super-telephoto lens and aiming it high in the sky, watch out for lens creep, which is when your lens zooms slightly during the exposure. I once found this to be the culprit of a soft image, when my Fujifilm 100-400mm lens wouldn’t lock down at one focal length. Eventually it stayed put, but the problem was a bit frustrating and ruined several of my shots. Always zoom in and review your images. 5. Don’t forget your wide lens. Telephoto lenses get most of the love during the eclipses, but wide-angle lenses can offer better storytelling. They can tell something else about where the image was shot—just think about what other elements of the scene you want to combine with the moon. Two rigs gives you that option. 6. Allow plenty of time to play. We mentioned that the lunar eclipse lasts a while. The totality, or umbra period, can last 1 to 2 hours. That’s a lot of blood moon! While the umbra phase can be the most exciting, start clicking as soon as the penumbra starts, when the moon remains white but starts to show all its phases as Earth casts its shadow. 7. Try a moon trail! High Roller & Lunar Moon Trail, 2014. 55mm focal length, 15 minutes f/8, ISO 400. With so much time, why not set up one rig dedicated to shooting the entire eclipse and then stack it together for a very unique moon trail? The beam will be wide and bright during the penumbra period but get skinnier and a little dimmer during the umbra period. I’ve seen only a few images using this technique, and I definitely want to give it a go next time! Given the length of this long exposure, you’ll definitely want to make sure you have plenty of power in your camera. I’d at least want to add a second battery and attach a power grip—but for even more power and reliability I’d hook up the camera to a Tether Tools Case Relay or ONsite power solution. 8. Do a time lapse or capture some video. I’m a still photographer, but moving images can help tell a story in more detail. This could be especially helpful if you are battling clouds or weather. Dedicate that second rig to video and keep that powered up with the Tether Tools solutions listed above. I slapped my hand against my head when I saw these images pop up on social media. I love this technique for neon signs and buildings but it didn’t cross my mind with the moon! Especially during the dimmer umbra phase, you can get exposures of 3 to 8 seconds. Use a telephoto lens zoomed all the way in, then midway into the exposure zoom to the widest end and leave it there. Two moons for the price of one! 10. Include the moon with other night elements. Match up that moon with car trails or other bright things that move. We often default to the telephoto close-up of the moon, but how else can we tell the night story? Emphasize movement in your image! In my image from Atlanta, I really wanted car trails and the lunar eclipse—I wanted those leading lines taking us to the moon! Perhaps you could shoot the moon next to moving water, or add star trails surrounding the moon. Full moon and eclipse photography are techniques that totally lend themselves to creative and fantastic composites. Show us all the phases of the eclipse in an interesting pattern. Place the moon anywhere in the world! Compositing images—taking elements from multiple shots and combining them—can totally unleash a new fantasy location. My advice on compositing is to have a clear vision and stay true to it. Larger-than-life moons make a viewer realize the moon “doesn’t belong” in the scene, however if the rest of the image is pure fantasy then it is totally acceptable. In my image from this week, the moon is bigger than it normally would have been but still has a somewhat realistic feel. Also, I was feeling really under the weather. But I really wanted to grab some frames of the eclipse, despite all these roadblocks. So I popped open PhotoPills and saw that the super blood wolf moon would be arcing right between the houses by my studio. I decided to shoot it from the tiny deck outside the studio door. The Weather Underground app (left) and PhotoPills’ eclipse and Night AR features provided all the info needed about where and when to shoot the eclipse in Catskill, New York. For about 2.5 hours, I popped in and out, trying to avoid frostbite, and I worked through an image sequence that got me fully into totality. And then, for kicks, I ran through optimizing exposure length versus ISO during totality. I mean, it was an hour long, right? The worst thing I could get was frostbite. Nikon Z 6, Nikon 300mm f/2.8 lens. 1/125, f/14, ISO 100 (full moon); 1/2 second, f/4.5, ISO 100 (totality). Honestly, I thought the 1/2 second exposure was the sharpest that was acceptable to me. Either way, note that the chart above is for a 300mm lens. Results will be even more restrictive with a longer lens, such as a 600mm. It’s important to bracket and test in the field. For several days this week we saw some of our workshop alumni post incredible images on social media. We asked a few if they’d share their stories and lessons learned, and we were thrilled that they are happy to do so. © 2019 Gary Domrow, instagram.com/gsdpic. Canon 5D Mark IV, Canon 100-400mm f/4.5-5.6 lens with teleconverters. 1/2 second, f/8, ISO 1600. I set up the tripod up in my driveway here in Austin, Texas. I had hoped to do a sequence but the first part of the eclipse was obscured by clouds, so I took pictures for just about 15 minutes on either side of the beginning of totality. I shot them using the Canon 100-400mm, some with the Sigma 2X teleconverter and some with the Canon 1.4X, set up on a Really Right Stuff tripod and ball head. I used the “live view and zoom in” method to focus, and actually remembered to try a few different settings for ISO, shutter speed and aperture. Despite using that lens and teleconverter combination, I must not have been zoomed in quite all the way because the focal length is 525mm according to the EXIF data. So I cropped the final image. What you see is maybe 30 or 40 percent of the original frame. Finally, I did some minor tweaking in post with Lightroom—Exposure, Contrast, Noise, Clarity. I guess I can’t say I learned anything new. I just practiced and reinforced the techniques that I have, which is also a good thing. Well, I did learn later that some people are really lucky—did you see this article about the meteor hitting the moon during the eclipse? I guess as long as you are out shooting the night sky, there’s always a chance you’ll catch something unique or interesting or unexpected. © 2019 Heather Cunningham Wendelboe, bolo-photo.com. Nikon D750, 20mm f/1.8 lens. I’ll pretty much always have a story, because every time I go out on one of my “automotive astroscape shoots,” I set myself up for a major mistake—since I always want to try something I don’t know how to do! So here’s the whole story of my disaster. I had planned for one my usual automotive astroscape shoots. My intention for my final image is always to share a vision as if you had looked out a window and watched the whole experience through the night—to inspire someone to go on a late-night road trip out there in the middle of nowhere. A secondary intention is to showcase my passion for driving these cars the way they were meant to be driven and not just hoarding them in a garage. This was my first attempt at a lunar eclipse. I wasn’t thinking about what would be different than other night photos I’ve done, so I composed like I normally would. The focus and exposures actually turned out pretty good, considering the haze in the sky and the lens fogging up, not to mention the microscopic size of the moon with a 20mm lens! The main problem was that at the time I started shooting the moon, it was in the middle of my frame, and there was not enough room at the top of the frame to fit the entire sequence of exposures as planned. So, right about the time of maximum totality, the moon just dropped off the edge of the composition! I wish I had set up the camera to shoot the entire sequence of the eclipse, and then I could have done a second setup for the composition and foreground exposure, since the final image would have to be a composite anyway. When it came to editing, I cropped out about two-thirds of my frame to make it a vertical, which helped get rid of a lot of the vertical line distortion and placed the moons in a better position from side to side. But with the vertical orientation, looking from top to bottom, I ended up with literally the middle third of my frame being blank sky. I posted that version to the National Parks at Night Alumni Facebook group. After talking with several people in the comments about all our lunar eclipse photos, I decided to try a re-edit: I moved the moon sequence lower to fill the blank sky, then I cropped it back to horizontal. Moving the moons to an inaccurate position in the sky bothers me, because no one who could have been there watching that scene would have seen it this way. But the resulting composition is acceptable. Lesson learned: You can’t recover what you didn’t shoot. And if you mess up what you did shoot, you owe it to yourself to salvage it, because your failed attempt required the same effort that a successful one would have. It wasn’t your work, only your decisions, that made the difference. © 2019 Randy Christ, MovingImagesPhotography.com. Canon 5D Mark IV, Canon 100-400mm f/4.5-5.6 with 1.4X teleconverter, on an iOptron SkyGuider Pro EQ Camera Mount. 20 seconds, f/8, ISO 100. 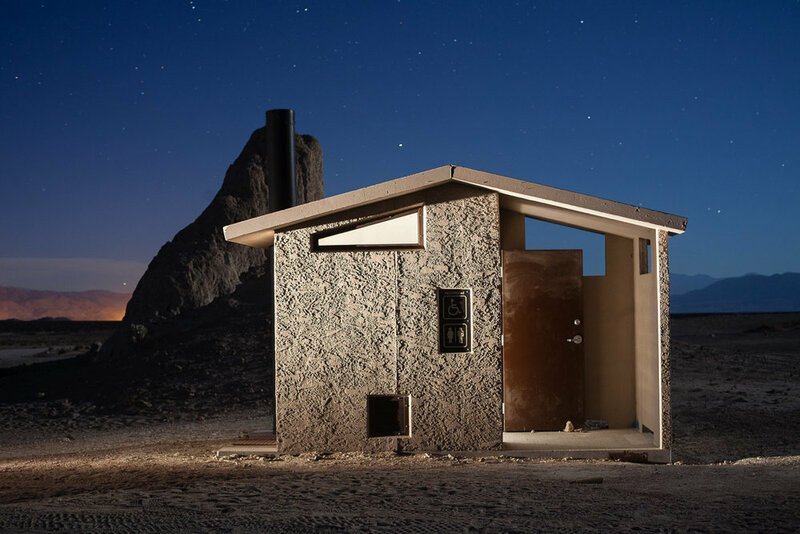 The photograph is a single image—no HDR, no compositing, no Photoshop. All the editing, cropping, etc. was done with Lightroom. Image stabilization was turned off, and focus was set to manual. The camera was mounted on an iOptron SkyGuider Pro EQ mount, which was configured to track the moon precisely. The 20-second exposure time was chosen to hold in check the star trails that would occur due to the moon and stars moving at different rates in different directions. Also, this shutter speed allowed for the settings of ISO 100 and f/8, which are the sweet spots of this camera and lens. This was my first attempt at shooting with an EQ mount, and the comedy of errors I made kept rolling all evening. Talk about lessons learned—as well as just some bad luck. But I also had some good luck, and came away with some shots I am pretty happy with. I decided to process this particular image in the series because it caught the fleeting moment when the moon was just about to leave the umbra shadow of Earth, ending totality. During totality, the light that reaches the moon travels through the inner layers of Earth’s atmosphere, which passes along the longer-wavelength orange and red light. This is why the moon turns orange during totality. In the moments just prior to reaching the end of totality, some light reaches the moon after having passed through Earth’s ozone layer, which passes along blue, shorter-wavelength light. This results in a small strip of purple trim on the leading edge of the moon. It is a unique and splendid moment that occurs for only a brief moment in time. © 2019 Martha Hale, instagram.com/marthahale. Canon 5D Mark IV, Canon 70-200mm f/2.8 lens. I was fortunate enough to shoot the solar eclipse of 2017 with National Parks at Night, so I knew I wanted to give this lunar shot a foreground element. Using PhotoPills, I scouted numerous skyline and landscape possibilities around town, only to realize this event was going to be happening straight up in the sky far away from the horizon. Change of plans. 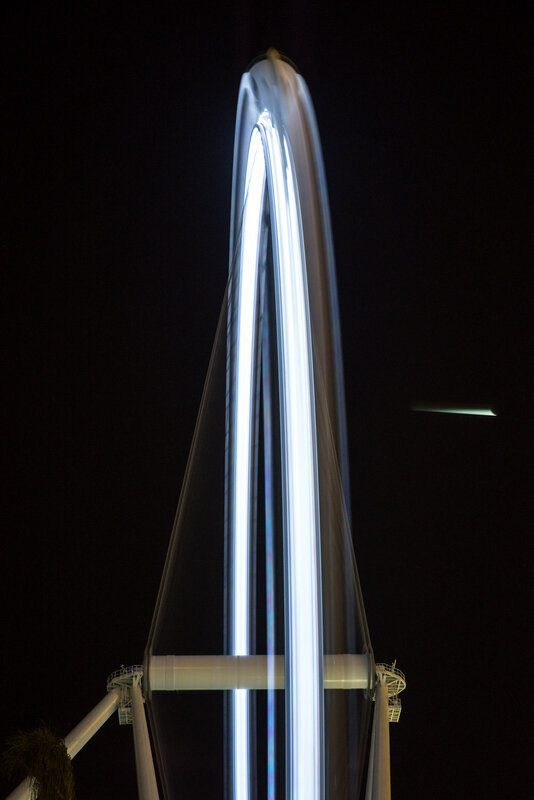 I scouted taller locations such as the statue of Vulcan in Birmingham, but newly installed multicolor LED lighting was going to be a challenge. I pondered Sloss Furnaces National Historic Landmark, but without NPAN, would they let me in that late again and turn off all the lights? Slim chance. At the entrance to my neighborhood is a rather large replica of the Statue of Liberty. I couldn’t resist. I ended up liking a composition from directly beneath the statue with my lens aimed straight up, shooting with a Canon 5D Mark IV and a 70-200mm lens. I bounced all night between that and a Fuji X-T3 setup with a 100-400mm f/4.5-5.6 lens plus 2X extender. I was struggling with the loss of stops at f/9 with the Fuji, and with chasing the moon to keep it in the frame (should have used my star tracker from the previous eclipse), and with having to bump up the ISO so much once we were in totality. I was getting frustrated, so when my husband came to check on me, I was ready to pack it up. But first I handed him a flashlight and asked him to point it at the face of the statue. 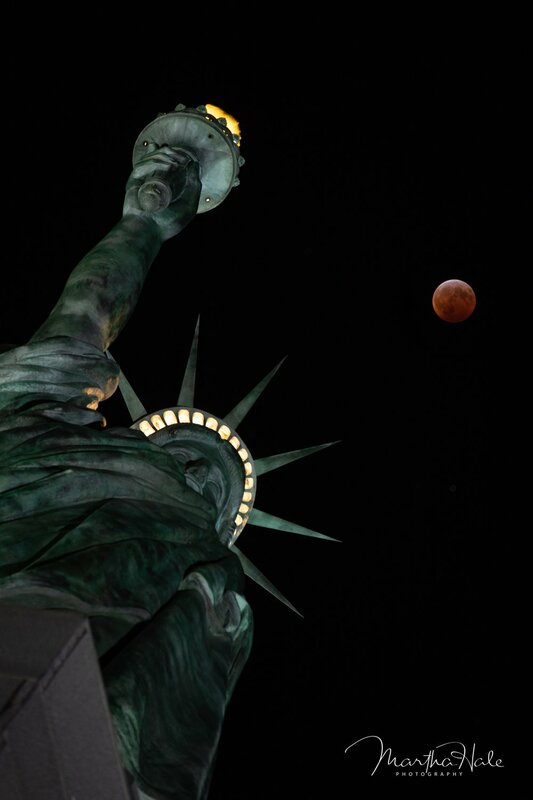 I went back to my Canon and decided to do one final composition with my focal point on the statue, and just to be sure, took the time to do one more shot focusing specifically on the moon. I’m so glad I took that extra step, because when I got back to the full screen of my computer, the moon was slightly out of focus in all the earlier shots! I stacked the two shots in Photoshop for the win! © 2019 Susan Wales, susanwales.ca. Nikon D810, Sigma 150-600mm f/5-6.3 lens. I did not do a time lapse, but rather only took individual frames and put them together in Photoshop later. It would have been hard to do a time lapse because the settings changed a lot from the beginning to the end of the eclipse. I did not realize that the color of the moon would change so dramatically from white at the start until the blood moon color developed with the full eclipse. That was fascinating to watch. I pre-focused to infinity, locked my focus down and then shot in manual mode. I started to photograph at 8:50 p.m. (in British Columbia) and finished at 10:09 p.m. when the clouds moved in. I started with an exposure of 1/6 second, f/5.6, ISO 64 and finished at the height of the eclipse at 1.3 seconds, f/5.6, ISO 2000. I adjusted my camera settings manually as the light changed on the moon. © 2019 Steve Winker, whereswinker.com. Canon 6D, Tamron 150-600mm f/5-6.3 lens. ﻿I shot the eclipse from the RV Park I’m staying at in Tucson, Arizona. Unfortunately, my site is right next to a 40-foot wall separating the RV park from Interstate 10. So there wasn’t any decent foreground. Plus, there’s a very tall bank of lights right there. The main thing I learned was that I shouldn’t have set up so close to a very strong light source high in the air. At totality, it was almost impossible to see the moon thru the haze created by the light. The strong haze also caused my photos of the moon at totality to be a little hazy. I really didn’t learn too much else this time. But I had shot a lunar eclipse in 2014 and I applied what I had learned from that shoot to this one. Based on that shoot and the fact that I didn’t have a foreground to use, I made the decision to zoom in and make a composite using several stages of the eclipse. I did no cropping. I just took the five frames into Photoshop as layers, masked out the sky in each layer, and then moved the five layers so that the moons lined up. Thank you to those six fantastic alums for sharing their images and their stories! We’re continually inspired by the photography we see coming from the fine folks we get to work with throughout the year. So, who’s next? How about you? We’d love to see your photos of this week’s lunar eclipse, and to hear the stories behind them and the lessons you may have learned. Please feel free to share them in the comments section below or on our Facebook page. Wow. That … was epic. Whether you experienced the solar eclipse of 2017 in the mountains or the cities, with a small group of friends or with the masses, or even just online, that was the most universally experienced eclipse ever! As we slowly come down from the high of the event, we want to share our story with you. All five of us here at NPAN witnessed the eclipse in different ways. Chris, Matt and I saw totality, and Lance and Tim took time out in their location to stare at the waning sun. I planned a small, hands-on Adventure Series workshop around the event. We lived on a ranch at Exit 0 in Montana and then drove two hours to the remote wilderness to capture totality. Matt collaborated with B&H and Atlas Obscura at a Total Eclipse festival in eastern Oregon and made the most of his two minutes by creating eclipse portraits during totality. And Chris probably did the smartest thing and simply shared the whole experience with his 4-year-old daughter, laying together on a blanket in the grass outside a zoo in Greenville, South Carolina. Tim was leading a workshop in smoky Glacier National Park and guided the students not to shoot the blocked sun but instead to capture the unique rays of light from a minimal sun. And Lance, who had just recently moved to Vermont, took time out of his day to take it all in with his fiancée. In this post, Matt and I share how we prepared for our shoots, and the ideas we had for capturing and creating during the whole of the eclipse. I’m always looking ahead to unique celestial events that we at NPAN can share. When I first learned that the Great American Eclipse was going to be passing through an area I frequent, Montana, I knew I had to start planning! 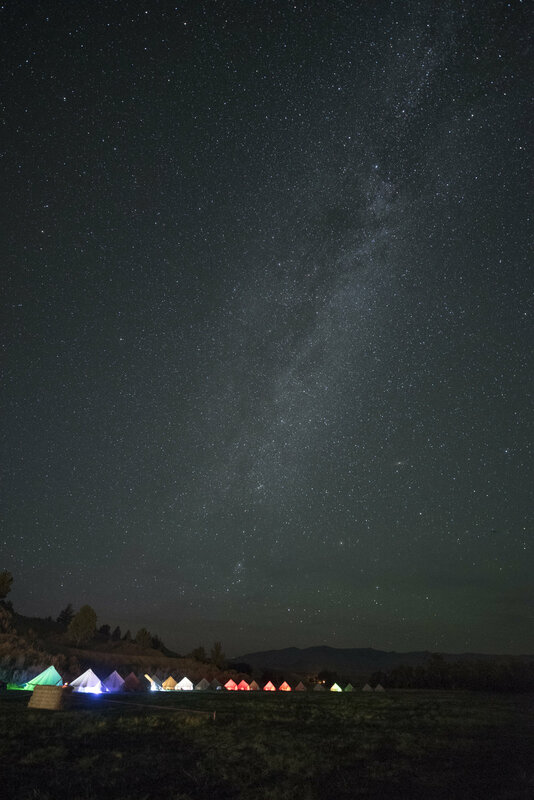 As it turns out, I was invited to the rural big night skies of J Bar L Ranch in Centennial Valley. Located about one hour from the path of totality, I had initially planned to avoid the crowds and just shoot and share the eclipse at the ranch. When we posted the details of the workshop, we even downplayed the eclipse aspect because you never know with weather. However, we received several emails from “eclipsers” who told us that they would rather see the total eclipse in front of a pile of rubbish than a partial eclipse in the most beautiful place in the world. So we changed the game plan and I started researching nearby locations in Idaho that would be in the path of totality, which I was able to scout a year ahead of time. My first thought was to go to Sun Valley and get close to Stanley, a small town smack dab in totality, But when I heard that this small town of 50 people was expecting 50,000 visitors, I starting looking for locations even more rural. Figure 1. Idaho’s Sawtooth Mountains. © Gabriel Biderman. In the end I was guided by stormy weather and magical light. I was visiting the small towns of Arco and Mud Lake when an impressive storm drew me toward the Sawtooth Mountains (Figure 1). I pulled off and drove down a dirt road to gain a better vantage point to shoot the rays of light dancing around the mountains. I knew I was in the path of totality and pulled out the PhotoPills app to confirm that the sun would be seen over the Beaverhead Mountain Range at the time of the eclipse. Figure 2. PhotoPills’ VR overlay of the path of the sun over the Beaverhead Mountain Range. It was important for me to have an interesting foreground, as I wanted to have our students have a wide-shot option when photographing the eclipse. (Hi, Matt here!) I was a polar opposite to Gabe. Imagine that. I wasn’t really interested in photographing the eclipse stages before and after totality. Why? I am happiest shooting at night, and totality was what I was looking for. The heat was on to make a plan for those two minutes. I love making night portraits. So I challenged myself to stage and shoot as many portraits as I could pull off during totality. I knew the exposure would be akin to end-of-dusk light levels. So I grabbed my Sigma 35mm f/1.4 Art lens to make both the subject and the sun/moon combo a size that felt appropriate to me. Figure 3. Night at Atlas Obscura’s eclipse festival. We were set up in a field on a private farm in Durkee, Oregon, for Atlas Obscura’s eclipse event. I was hanging out with the B&H Photo crew, enjoying all the solar-equipped telescopes they brought to observe first bite and the looming totality. The crowd was abuzz with anticipation (for the eclipse—not for what I was doing.). I grabbed a speedlight and a Luxli Viola, and prepared to test. As we discussed in our “NPAN 2017 Solar Eclipse Guide,” the most important thing you can do to prepare for the eclipse is practice shooting the sun. Zoom lenses need constant monitoring to track the path of the sun in the sky. Solar filters take some getting used to looking through, as they darken everything but the sun. We practiced tracking for several days right before the eclipse. If you can practice during the same time of day, you’ll get a feel for how high you need to track. I found that the autofocus of the zoom lens did a good job, but because we were pointing directly above us at noon, my lens had issues with creeping. I had to gaff-tape down my zoom ring so that it would stay all the way zoomed out. Investing in a lens that locks its zoom at multiple focal lengths would be very wise. All of my practice is from years of night photography and flash portraiture. I’ve been shooting in dim light combining those two practices for a while, so I felt confident I could make it happen when the time came. But it didn’t stop me from thinking though the possibilities over and over while waiting. I did fret a little. But the Light Painting Party the previous evening had me feeling all sorts of good. My wide setup was the Nikon D750 with the Nikkor 14-24mm f/2.8 lens and the cardboard DayStar Solar Filter. My settings during the eclipse (not totality) were 1/125, f/8, ISO 800. I manually set focus at hyperfocal distance so that everything was sharp from 10 feet to infinity. My telephoto setup was the Fuji XT2 and 100-400mm f/4.5-5.6 lens, with the best filter holder system I have ever used, the Wine Country. Even with the dubious Amazon scare, I stood by my Lee Solar Eclipse Filter, as I had used it for many hours without any issues. My base settings were 1/250, f/8, ISO 800. I wanted to simplify my shooting during totality as much as possible and set up both cameras to bracket. To capture the “diamond ring,” I closed down to f/22 to heighten the flare, increased the shutter speed to 1/60, and bracketed as best I could. The light bursts were bright and quick and the bracketing worked out really well. The 1/2-second exposure gave me the best corona (see Figure 4) and 1/250 captured the Bailey’s beads (Figure 5). But the most dramatic image was the flare from the diamond ring effect, which worked out best at 1/15, f/22, ISO 800 (Figure 6). Figure 4. Corona. 1/2, f/22, ISO 800. Figure 5. Bailey’s beads. 1/250, f/22, ISO 800. Figure 6. Bailey’s beads, or the diamond ring effect. 1/15, f/22, ISO 800. During totality I lowered my shutter speed to 1/15 and bracketed again. I should have also opened my aperture, but I was trying to keep things simple while running between two rigs. The best exposures ended up being 1/15 and 1/30, as exposures at or over 1/8 tended to be too blurry with the rather rapid movement of the sun and moon. In hindsight, I should have opened my aperture to f/8 and kept my shutter speeds in the range of 1/125 to 1/250. It was very important to put my camera in the highest burst mode, to shoot in RAW (of course) and to still bracket. Keep the trigger firing and take some time to take it all in. I popped the CTO-gelled speedlight on a tripod and tested the output. Why CTO? Well, I wanted to shoot with Tungsten white balance and the flash should be neutral. I then grabbed the Luxli Viola and set it to 5000 K. I placed it lower than the speedlight, but on axis. I’ve been studying how cinematographers are making the shadows and highlights different color balances. So I wanted a cool shadow undertone from the LED light and neutral/warm from the flash. And the sky would look cool because of the Tungsten setting. I revved up my Nikon D750 and Sigma 35mm with no filter. Why? It’s totality—this is night photography, if but for a moment. Figure 8. 1/25, f/6.3, ISO 200. Figure 9. 1/3, f/6.3, ISO 200. We swapped places and by the time John shot two frames of me (Figure 10), our two minutes of totality were over. Wow. Talk about pressure! Well, that was the quickest two minutes in my life! It was magical to have the sunlight change so drastically and to have hard “night” shadows engulf us. Typically moonlight is very soft, so this was very surreal. I saw only the brightest stars and planets—it was a very silvery civil twilight. The drastic drop in temperature brought an eerie chill and the only creatures close to us were flies that appeared out of nowhere when the lights came back on. I did watch too much of totality from the back of the screen and really wish I had spent more than 15 seconds staring at the sky. I was laser-focused on one mission. OK, two. I forgot to mention I was running a time-lapse with a fisheye from ground level on Aperture Priority (see below). Anyway, my one mission (I told myself) was to do something no one else was likely to be doing. I like to zig when others zag. I’m known for it. It’s curiosity. I love that feeling of, “Oh, this might not work.” In fact, I told John and those who didn’t get a chance to get their portrait done that very same thing. I was listening intently to everyone around me. I heard the hush of wildlife. I heard the birds all speak up at once, then crickets. I felt the temperature drop and one of the scientists nearby exclaim in glee, “It’s 62 degrees Fahrenheit—a full drop of ten degrees!” I felt the mosquitoes rise up and eat me alive. I heard all the oohs and aahs of everyone marveling about all the stars in the sky behind us. But I saw none of it. I was on task. Do I regret not enjoying the eclipse with my own eyeballs? Not at all. Because now I would be regretting not trying for something that was a pressure-based stretch goal. I tried, and I believe I succeeded. In fact, I got a diamond ring in my portrait. Pretty rad. I was able to share this experience with my dad as well as nine Centennial students, which was incredibly special. We were all alone among the mountains, and it would have been weird to experience it all by myself. Viewing it in a city would have been more of a universal gasp of astonishment, but I really appreciated the people I was with and the earth that surrounded us. We all promised to meet back up in 2024! It was difficult to remain cool, calm and collected during totality. I totally forgot to turn on my 360-degree video camera, which would have been a unique way to capture the changing light and our reactions. Maybe next time we can work together and have each person be responsible for one way to interpret the eclipse—that way we would be more focused and could share the many results. Figure 11. Composite of 25 frames showing the full sequence of the solar eclipse. Nikon D750 with 14-24mm f/2.8 lens and DayStar Solar Filter. Each frame (except totality) shot at 1/125, f/8, ISO 800. In the end, the close-up shots give you a closer look at all the incredible things that happen moments before, during and after totality, but after the rush of it all, I’m really enjoying the wider-view composite shot of all the sun phases over the scene (Figure 11). I feel like I accomplished the standard takes on the eclipse and look forward to challenging myself for a new perspective in 2024—or before! I was very fortunate to be where I was, when I was. I wasn’t originally scheduled to go to the festival, but a series of other things put me in a position to represent NPAN at Atlas Obscura’s exclusive event. I’ve always admired the cut of their jib. Their focus on adventure, satisfying curiosity and generously sharing is right up my alley. And I met a host of like-minded people there. It was kismet and I would do it all over again exactly the same way. Next time, however, I will bring about five cameras. That may be in Argentina in 2019 or 2020, or much of North America in 2024. I am hooked. That was a truly singular experience. Did you photograph the solar eclipse? We would love to see your images in the Comments section below! Night in Day: How are you Preparing for and Shooting the Eclipse? Note: This article is also featured in our brand new free e-book Here Comes the Sun: 2017 Solar Eclipse Guide. The e-book also includes the articles “Parks in the Dark,” a travel guide to all the National Park Service units that the total eclipse will pass over, and “The Right Stuff,” a detailed buyer’s guide for all things related to eclipse photography. Download your copy today! If you haven’t heard the buzz yet, the continental United States will be experiencing a solar eclipse on August 21. If the weather is good, we will all be able to see … most of it. But lots of lucky folks will be driving to a spot along the path of totality to experience something very rare and surreal: the total eclipse, when day turns into night. For approximately 1 to 2 minutes you’ll be able to see the stars during the day and the wild corona light dance from behind the moon. The last total solar eclipse to touch the lower 48 was on February 26, 1979. The last time we experienced a total solar eclipse crossing our entire nation from the Pacific to the Atlantic was on June 8, 1918. That was a long time ago; it’s pretty rare. The good news is that, at least this time around, it won’t be rare for long. The next total solar eclipse in the U.S. after 2017 will be in 2024, when the path of totality will cross from Mexico into Texas and will leave via northern New York and New England on its way to New Brunswick and Newfoundland. So any specialized gear you get now, you can put to good use in seven years! The last trans-U.S. total solar eclipse happened … well, awhile ago. As you have probably guessed in life, it is not a good idea to stare at the sun. The most important thing you can purchase to prepare for the eclipse is a pair of solar glasses for your eyes and solar filters for your camera lenses. Technology continues to get better in this field and the newest international standard rating is ISO 12312-2. If you do not see this certification on the product, you shouldn’t purchase it. Solar filters absorb the ultraviolet, visible and infrared energy of the sun, making our star safe to view and photograph. B&H Photo, home of my day job, has been a great resource for embracing the best products and knowledge. To that end, I have been recently practicing shooting the sun and want to share this knowledge with you. As far as glasses go, any simple paper pair will do, as long as it has the aforementioned ISO rating. A cool thing that B&H is doing is packaging free solar glasses with most of their solar filters! So you can kill two birds with one stone, all while not killing your eyes or camera sensor. The screw-in filter is the one I would least recommend. Even though it seems to be the most popular, think of this: The common strategy for shooting the eclipse is to have a filter over your lens so that you can capture a properly exposed and non-flaring sun. Once we enter the small window of totality, when the moon will eclipse the sun, it will be safe to take the filter off and adjust your exposure accordingly for that beautiful shot of dark sky and the white ring around the moon. 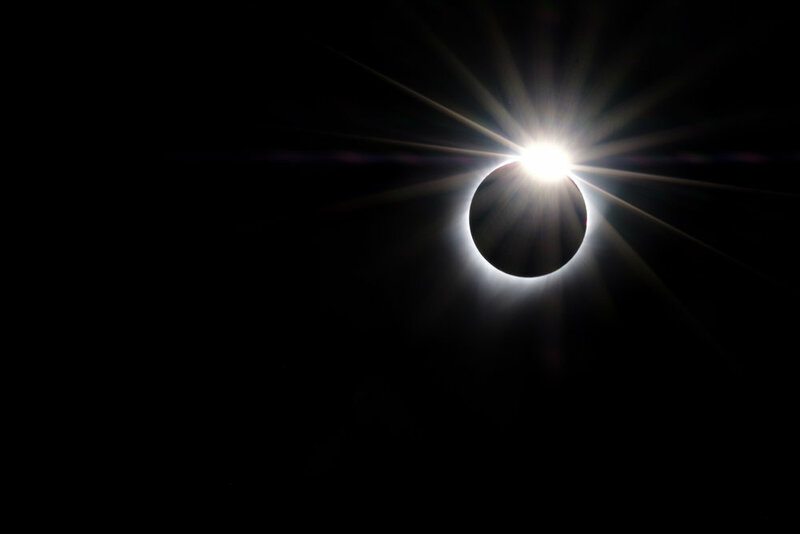 You must wait until after the “diamond ring effect”—when the sun flares one last time from behind the moon—before taking off the filter. You don’t want to waste precious time (5 to 10 seconds) unscrewing a screw-in filter when you could instead take 1 to 2 seconds to remove a drop-in filter or universal filter cap. The average time of totality will be from 1 to 2 minutes and you want to photograph it but also experience it. Don’t waste precious time fumbling around with your gear! The first time you shoot the sun shouldn’t be on August 21. Get some solar filters and start practicing shooting the sun now! I’ve been doing this over the summer, which has given me a chance to test exposures and specific gear before the big day. I recently purchased the Solar Eclipse Filter by Lee for my Wine Country Filter Holder system, as well as the Daystar universal solar lens filter. My MrStarGuy Adjustable Objective filter is on back order, but should be shipping soon. Lee is one of the top-end filter companies. Their filter mentioned above is equivalent to a 20-stop neutral density, but also is ISO certified and should be used only for solar work—not for long-exposure landscape photography. Wine Country Filter Holder system and 100-400mm lens. The Lee filter is made of glass, and I find the image quality is excellent. The suggested settings from Lee with this filter are 1/800, f/8, ISO 800. Think crazy eights! This was pretty spot-on while the sun was high in the sky around 2 p.m. I also tested the Daystar slip-on filter and found that to be of very good quality as well. It was a bit deeper orange/yellow than the Lee with the white balance set to 10,000 K. I also found the Daystar to be 1 1/2 stops faster than the Lee, as my final exposure setting was 1/500, f/5.6, ISO 800. Sun shot with Daystar filter at 10,000 K white balance. 1/500, f/5.6, ISO 800. There are multiple ways to capture and create some unique images of the eclipse. Search Google Images to see what resonates with you. I definitely recommend using a telephoto lens and getting a somewhat tight shot of the different phases of the eclipse. The careful thing to consider is not getting in too tight. When the total eclipse starts you’ll see the breathtaking corona light start to spill out from behind the moon. This can spread pretty far and create some beautiful patterns. If you are in too tight, you’ll frame it out. When testing, I was using a 100-400mm lens on an APS-C crop sensor, and the far end of that focal range seemed like the sweet spot for a good telephoto capture. That’s 600mm to 800mm with a full-frame sensor, which you can achieve with really big glass or with a 1.4X or 2X teleconverter. But if you have a crop-sensor camera, that would be the one I’d lean on for this project. The trick to the telephoto shots will be tracking the sun as it quickly moves through your frame. Depending on how tightly composed your shot is, this setup could require constant attention and adjustments. Having a sturdy tripod is a must, especially if you add a tracking device to a long lens and camera. Make sure your tripod head and legs are rated to hold the combined weight over a long period of time. I’d also bring another, separate camera setup for capturing a wider view that includes the landscape. The telephoto phases of the eclipse are cool to capture, but they are generally featured against a dark black sky. If you use a medium telephoto or wide-angle, you can include some subject matter that gives your composition depth and scale. You’ll still need to have that solar filter on to capture more phases of the sun, but you’ll also want to get a properly exposed foreground—ideally once the uneclipsed sun is well out of the frame—to layer together in Photoshop. Underexpose the foreground shot so all the solar disks will stand out against that hopefully deep blue sky. Once the eclipse starts to happen, keep an eye on your settings and make adjustments to open up your exposure as the sun gets thinner and fainter. This is going to be the most viewed and recorded solar eclipse ever. You’ll be able to watch it in and around populous cities such as Kansas City, St. Louis, Nashville and Charleston, as well as in national parks such as Great Smoky Mountains and Grand Teton, and in many rural national and state forests. Do you want to experience this event in a city or town with tons of people and lots of rooftops and amenities, or do you want to go someplace more remote and get a darker sky? Staying flexible with weather is key. There are plenty of apps (we like Weather Underground) that can share predicted cloud cover. It’s a good idea to have a Plan B and C that are within a 1- to 3-hour drive from your Plan A. You obviously want to avoid overcast and thick cloud cover, but sometimes stray clouds and wisps are unavoidable. Do your best to adapt or adjust—we are wishing you the clearest of skies, of course! Don’t forget to enjoy and EXPERIENCE it! Sure, most of the United States will be watching the eclipse on TV, and that is … two-dimensional. But to actually experience the eclipse is something very special. Animals and humans both react to this astronomical phenomenon in extraordinary ways, and nothing can really prepare you for when the darkness takes over the land and sky. There is a reason people become eclipse chasers and travel the world to keep searching out this experience. Each eclipse and location is unique and different. We look forward to sharing photos of ours with you and vice versa. Read Tyler Nordgren’s book Sun, Moon, Earth—A History of Solar Eclipses from Omens of Doom to Einstein and Exoplanets. We are also a big fan of Tyler’s other book, Stars Above, Earth Below—A Guide to Astronomy in National Parks. He makes the science of astronomy very engaging, easy to understand and to get excited about. Send an eclipse to someone you love! The United States Postal Service has released a unique Total Eclipse of the Sun forever stamp. The stamps show the total eclipse, but when you touch them with your finger the eclipse reveals the moon. They used thermochromic ink that reacts to the heat of your finger! So stock up on these stamps and send a letter or post card from wherever you are experiencing the eclipse! Finally, if you want to learn some more about how and where to photograph the eclipse, download our free Here Comes the Sun: 2017 Solar Eclipse Guide e-book today! It includes this article, along with a travel feature about all the units of the National Park Service in the path of totality, as well as recommendations about photography gear and services, and eclipse information and swag.